The HWS perimeter safety screen is a self-climbing system for ensuring perimeter safety during the construction of high-rise buildings. Based on the MK system, it is versatile, it can easily be adapted to different geometries and has various configurations according to needs: straight section, with working platforms, debris section, with option to lift materials to different levels, with access stairs, etc. 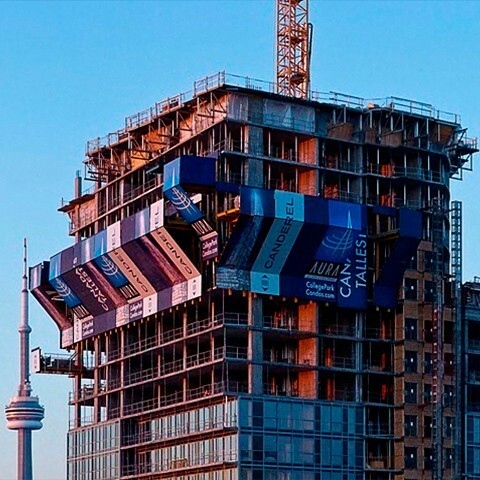 The HWS is designed to protect workers against harsh weather and prevent them, or objects, falling from the edge of the slab and also to protect pedestrians from falling debris. Prevents falls from the slab edge. Excellent protection against adverse weather conditions. Reduces the visual height effect. Provides a working platform at the slabs edge. Hydraulic self-climbing elevation, without crane. Can be anchored to slab or wall. Adapts well to the geometry of irregular slabs, including geometries varying in height. Encloses the entire perimeter without leaving any gaps. Provides large vertical surfaces for promotional messages. Material lifting platforms can be part of the windshield panels. Provides access between the last floors of the building. HWS with storage and material lifting platforms at different levels and working platforms. Basic section with platform for material unloading. Debris section: extension of the slab as perimeter working and material storage platform. It avoids falling debris when removing formwork tables and provides a large advertising area towards the street. 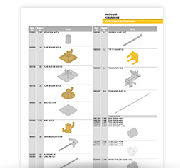 For more detailed information download the HWS product guide.